Chinese phone company ZTE is accused of lying and has been banned by US officials. HOW DID THINGS ESCALATE TO SUCH A LEVEL? The U.S. Department of Commerce has banned American companies from selling components to Chinese telecom equipment manufacturer for the next seven years followed by a broken agreement which they reached after when the company was caught red-handed illegally shipping goods to Iran. It is a big blow to the Chinese telecom giant as the American companies are said to provide 25 percent to 30 percent of the components which are used to make ZTE’s equipment, including smartphones and other gear and gadgets to manufacture telecommunications networks. It all started when the company was caught supplying U.S. goods and technology to Iran and it was followed by a federal court case in Texas, wherein it pleaded guilty to violating U.S. sanctions. They were asked to comply with an agreement under which the company paid $890 million in fines and penalties, with an additional penalty of $300 million that could be imposed. Another part of the agreement that ZTE Corp promised to fulfill was to fire four senior employees and get strict with 35 others and reduce their bonuses or rebuking them as punishment. Chinese telecom giant dismissed our senior employees. However, it had not reprimand or reduced bonuses to the 35 others. WHAT ZTE HAS TO SAY? The ban affected immediately and according to it, U.S. Companies can’t export restricted goods like chipsets directly or indirectly to the Chinese telecom giant. As the ban started, the company’s stock prices plummeted at rapid speeds. With this, other companies’ shares also got affected. One of the affected companies is Optical networking equipment maker Acacia Communications Inc. The company’s shares fell off to 35% as it gets 30 percent of its total 2017 revenue from ZTE. Another optical component company, Lumentum Holdings Inc fell 8.9 percent and Finisar Corp tumbled to 4.0 percent. Oclaro Inc. fell off 14.1 percent as it got 18 percent of its fiscal 2017 revenue from ZTE. The ban on supplying ZTE will come into effect after two months when two Republican senators. 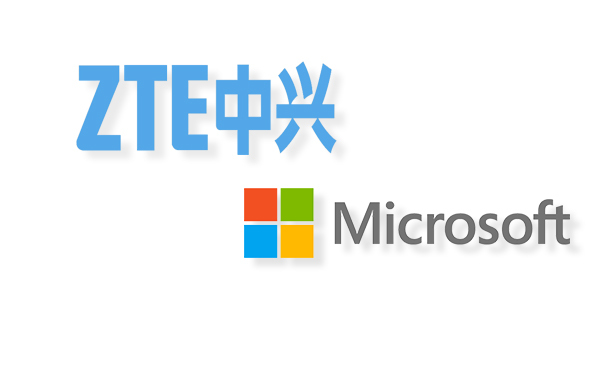 Instigated laws to ban the U.S. government from buying or leasing telecommunications equipment from ZTE or Huawei Technologies (company’s Chinese Rival). The reason behind this was the concern that the companies could use the privilege to access to spy on US officials. WHAT ARE THE STATEMENTS OF VARIOUS OFFICIALS FOLLOWING THE BAN? Britain’s main cybersecurity agency stated, “It has warned UK’s telecommunications sector about using services or equipment from ZTE. Well, the relations between the countries would get sour. Earlier the penalty and fine was criticized by China’s Ministry of Commerce and Foreign Ministry. Microsoft announces Azure Sphere, new intelligent security tools and technologies for an Internet of Things (IoT) and edge devices. As cyber threats and data insecurity is spreading all over the world, it is important to get a software or a tool to ensure the security. Microsoft has announced new intelligent security tools Azure Sphere to fight off all the security issues. “Azure Sphere” is said to be the first holistic platform to build secured, connected microcontroller unit (MCU) devices on the “intelligent edge”. A MCU-powered device, area of computing, is a new thing whose growth can be judged with the growing user base. MCUs seems to be in each article whether its toys or industrial equipment or household and with “Azure Sphere”, Microsoft has broadened the boundaries of the “intelligent edge” power and secure this category of devices. The company also revealed another new intelligent security features for its commercial Cloud offering, Microsoft 365. This commercial cloud offering is designed to help IT and security professionals to ease the process of managing security across their enterprises. WHAT OTHER TOOLS ARE LAUNCHED? “Microsoft Secure Score” and “Attack Simulator” are the tools released that help teams stay prepared and one step ahead of threats. “Secure Score” – The tool helps organizations to regulate which controls to enable to help protect users, devices, and data by judging readiness and providing an overall security benchmark score. “Attack Simulator, is a part of Office 365 Threat Intelligence, which allows security teams run simulated attacks which include mock ransomware and phishing campaigns, event-testing their employees’ responses and tune configurations consistently. The latest update of Windows 10, brings “Windows Defender Advanced Threat Protection” (ATP) works across other parts of Microsoft 365 to incorporate threat protection and remediation spanning Office 365, Azure and Windows. “Also available today in a preview, and with the upcoming Windows 10 update, are new automated investigation and remediation capabilities in Windows Defender ATP, leveraging Artificial Intelligence and Machine Learning to quickly detect and respond to threats on endpoints, within seconds, at scale,” the company said. A new “Microsoft Intelligent Security Association” which was formed for security technology partners so that they can contribute to and benefit from. The aim of creating an association is to get incorporated. Members of the association will be able to create more solutions for customers so that better protection and easy detection of attacks can be made possible.